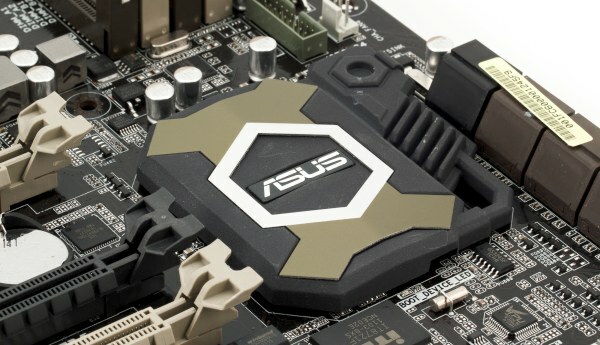 ASUS is probably the only vendor who can afford more than one series of 'elite' motherboards. One of those is obviously intended for gamers, the other one that we're going to review today is dubbed "TUF," which sounds like "tough," and is positioned as super reliable. In technical terms this means high-quality power circuitry, heat dissipation and such. ASUS Sabertooth 990FX is equipped with everything you may need for overclocking. It has fewer bells and whistles than gaming products though — noblesse oblige. But actually such motherboards are usually purchased by gamers as well. In particular, for multimonitor rigs which are these days better supported by Eyefinity-equipped Radeon cards working in the CrossFire mode. For this reason, ASUS Sabertooth 990FX has all the necessary PCIe x16 slots and enough PCIe lanes to connect as many monitors as possible. Possible configurations are x16+x16 or x16+x16+x8. 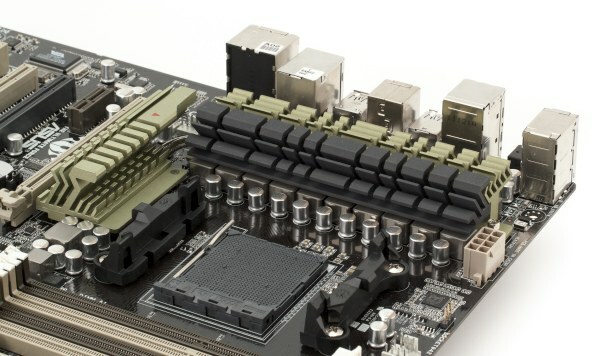 The fourth slot can offer 4 PCIe lanes. There is a lot of additional controllers, but motherboard's size remains within standard ATX dimensions (305x245 mm) and can be installed into any standard case. Even a cramped one, considering that SATA ports are situated a bit further from the edge than usual. The cooling system is passive, but there are no decorative plaque obstructing airflow. Instead there's ceramic coating — CeraMIX, one of key features of the TUF series — that is claimed to improve heat dissipation surface by 50%. There are also additional sensors for more accurate temperature reading. The Southbridge features an originally shaped heatsink with CeraMIX coating. It didn't warm up much in our tests. 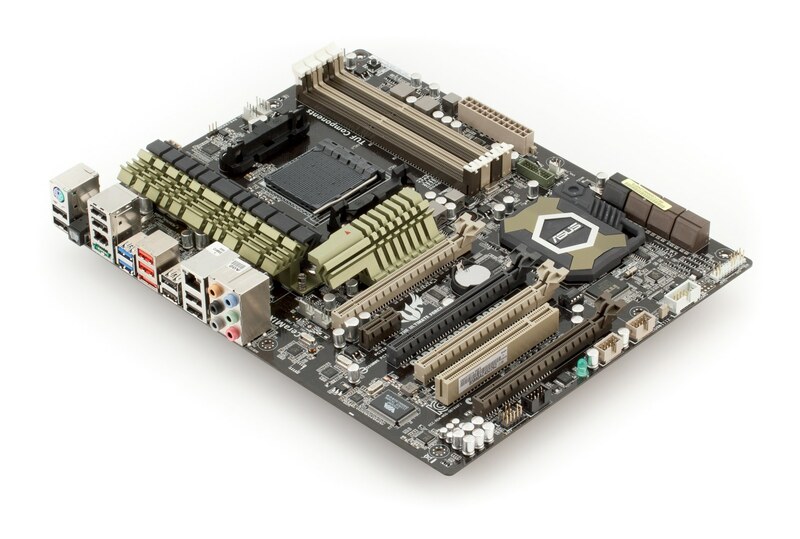 ASUS Sabertooth 990FX features a 10-phase VRM, with 2 highly efficient Low RDS(on) MOSFETs per phase. There are 11 x 820µF and 3 x 270 —F capacitors, all solid, made in Japan, with up to 500,000 MTBF at 65°C. 'Military grade' even. Coils feature composite cores. The device is controlled by the familiar Digi+ VRM that offers great leeway for overclocking. 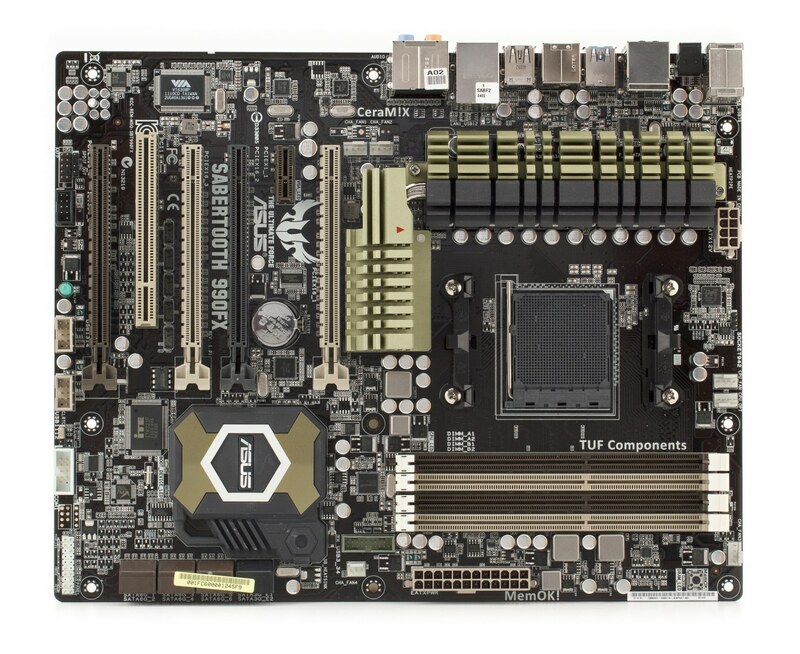 The motherboard supports all AM3/AM3+ processors with up to 140W TDP. Another peculiarity that can actually be found in cheaper ASUS boards as well is electrostatics protection — primarily of back-panel USB ports. The motherboard comes in a box that opens like a book, a rather compact one for its class. The package has no surprising bonuses, offering 4 x SATA 6Gbps cables with metallic latches, a set of Q-Connectors to help you organize front-panel cabling and a back-panel faceplate. 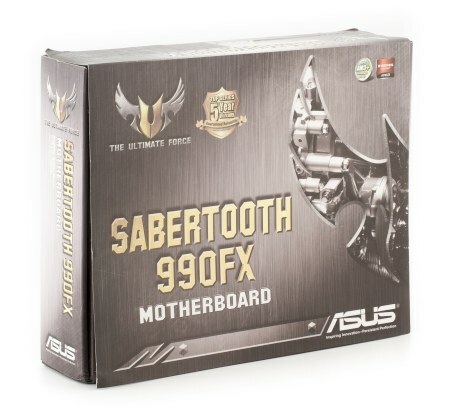 ASUS Sabertooth 990FX is based on the AMD 990FX chipset which is identical to AMD 890FX in terms of peripheral connectivity. It supports all AM3/AM3+ processors, up to 32GB of DDR3-1066/1333/1600/1866 RAM. There are 6 chipset SATA 6Gbps ports (RAID 0, 1, 0+1, 5), 2 additional SATA 3Gbps ports provided by a separate controller, eSATA that also works through an auxillary controller, and eSATA/USB combo ports on the back panel. Integrated audio based on the 10-channel Realtek ALC892 HDA codec, optical S/PDIF-Out on the back panel. Gigabit Ethernet based on Realtek 8111E (PCIe x1). 2 x SATA 3Gbps based on JMicron JMB362 (PCIe x1) supporting the total of 4 x SATA 3Gbps ports, 2 of which are on the back panel as eSATA and eSATA/USB. FireWire based on VIA 6308P (PCI) supporting 2 x FireWire 400 ports, one of which is on the back panel, the other is onboard. 2 x USB 3.0 based on ASMedia ASM1042 (PCIe x1) supporting 4 x USB 3.0, 2 of which are on the back panel. System monitor based on ITE IT8721F, supporting automatic control of CPU and system fans through preset modes (Silent, Standard, Turbo) or manually set max. and min. speeds and temperature thresholds. Both 3 and 4-pin fans are supported. All 4 system fans are controlled as one, which will be a disadvange if you need to control them separately. We tested the integrated audio solution in the 16-bit/44kHz mode using RightMark Audio Analyzer 6.2.3 and an ESI Juli@ sound card. Overall grade: good. Obviously, engineers didn't try to squeeze the maximum out of the codec, because the measurement results are moderate, even though the difference is hardly or not audible.